Movie : Kai Po Che! Kai Po che is a superb movie in my lifetime. Amazing and very sad movie! !Love you sushant~!! THE BEST MOVIE EVER!!!!! Gr8 Work Team KPC!!!! Finally the movie had its premiere last night. Can't wait to see it. All the best to Sushant for his debut. jan seems so far days r just crawling at a snails pace...ssr all the best!!! Related News of Kai Po Che! Kedarnath maintains a consistent pace at the box office! Kedarnath trailer clocks 10 Million views in less than 24 Hours! 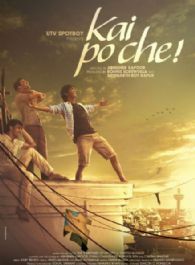 Photos of Kai Po Che! Videos of Movie Kai Po Che!